NOTE: The following blog entry explains what a Wiimote Whiteboard is, what it does, and how to build one. If you’re not interested in the details and just want some basic step-by-step how-to directions, check out this post. The center of any 21stcentury classroom has to be the interactive whiteboard. I used a Promethean ACTIVboard in my classroom for four years, and I don’t think I could go back to the days before it. An interactive whiteboard allows teachers to create much more engaging lessons through Web and video integration, save their lessons almost verbatim from year to year, save student work completed on the board, and turn any student into the teacher. That’s why hundreds of teachers have decided to make their own $55 interactive whiteboard. That’s right – you can make your own interactive whiteboard for less than the cost of a field trip. In 2007, researcher Johnny Chung Lee made a 5-minute video that changed the face of the interactive whiteboard market. What Johnny had discovered was that the Wiimote — the remote control that accompanies the Wii video game console — contained hardware sophisticated enough to simulate an interactive whiteboard. The basic idea is this: the Wiimote contains tiny infrared cameras within its housing that allow it to interact with the Wii sensor bar and, thus, create some pretty cool gaming experiences. The infrared cameras read the location of the infrared lights within the sensor bar, and that’s how they communicate the Wiimote’s position back to the Wii. Johnny figured out that he could do pretty much the same thing but, rather than moving the Wiimote, he would move the infrared light. If he kept the Wiimote stationary, it would track any infrared light within its vision. Since the Wiimote can talk to computers through Bluetooth, Johnny created some software to translate this location reading to his computer. Voila! As he moved an infrared light around on any service, the Wiimote tracked it and translated it as a mouse’s motion to the computer. You can build an infrared pen, using $15 worth of parts and equipment from Radio Shack. Using Bluetooth and free software based on Johnny’s original program, you can connect a $40 Wiimote to your computer and have it track your pen across your whiteboard, just as an ACTIVboard or Smartboard would track a pen across its surface. How do I build a Wiimote Whiteboard? Build an infrared pen, using supplies you can order online or pick up at RadioShack. Ken Moore provides a detailed tutorial (below) on how to build a pen, complete with a shopping list that includes part numbers. I used Ken Moore’s tutorial to build my pens (it took about 90 minutes to build and troubleshoot the first one; then about 30 minutes for subsequent pens), and I would make three addendums to his shopping list. He doesn’t tell you this, but you’ll notice in the video that he uses a drill with a 1/4-inch bit to drill a hole into the pen casing. If you don’t have a drill and can’t find one to borrow, it’s possible (though not recommended) to make this hole using an ice pick to start it and a pair of scissors to widen it. I’m not the best of solderers, so I found that when I tucked everything into my pen, the metal from the red and black wires were rubbing up against each other, causing a short circuit (and the pen to get REALLY hot). To fix this, I bought some electrical tape and taped over my solders and any exposed wire. Remember when building your pen that infrared light is invisible to the human eye. You can test your pen by holding it up to a webcam or video camcorder, which pick up infrared light. NOTE: If you don’t want to or can’t build your own pens, there are several distributors on the Web who sell them at reasonable prices — just Google “buy infrared pen.” I think it’s a better idea to build your own, if possible, though, because then you have a good understanding of how everything works and you can repair it if necessary. Be sure that Bluetooth is activated and working on your computer. Then, connect your Wiimote. The specifics here are different, depending on your computer and your Bluetooth driver. On my computer, I connect my Wiimote just as I would any other device — I have to click on the “My Bluetooth Places” icon and tell it to search for devices. I then hold down the 1 and 2 buttons on the Wiimote until my computer finds it. I tell My Bluetooth Places to connect to the Wiimote. The Wiimote has no pin number, so I skip that step. If that doesn’t work for you, though, here are step-by-step instructions for connecting your Wiimote using the BlueSoleil driver software. If you don’t have Bluetooth, you can buy a Bluetooth Dongle for about $10 that plugs into your computer’s USB. Here are step-by-step instructions for setting up Bluetooth with a Dongle and Wiimote. You’ll need calibration software so your Wii knows exactly where on the board your infrared pen is. I tested a ton of FREE calibration software and highly recommend uweschmidt’s Wiimote Whiteboard, which is available for Mac and Windows (on the link, scroll down to the “Download” section and select “Cross-platform Java Version” if you’re running Windows). It’s reliable and has consistently worked well for me on both platforms, plus its creator is pretty good about supporting his software. You don’t need it, but the program also allows you to use multiple Wiimotes to calibrate your board so, for example, if one Wiimote is blocked, the other will pick up the location of the pen for added reliability. Once you’ve installed the software, hook up your Wiimote to your Bluetooth and start the Wiimote Whiteboard program. It should pop up a window that tells you how much battery life is left in your Wiimote and that has a “calibrate” button (see photo). 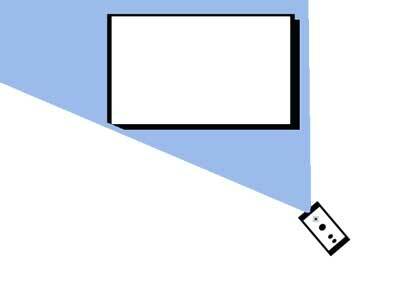 Set up your projector so it projects your computer screen onto your whiteboard (or any other surface). When you think your Wiimote is set up properly, click that “calibrate” button and, just like with any interactive whiteboard, use your pen to click on the targets. If the Wiimote isn’t picking up on all your clicks, you’ll have to adjust its placement (this is where using two Wiimotes — one on either side of your screen — might be beneficial). 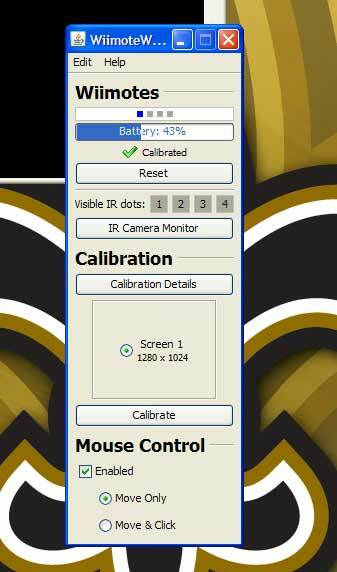 Once you’re calibrated, click around the screen — your infrared pen should work just as a mouse would. In that Wiimote Whiteboard window, you can set whether you’d like a click of the pen to simply move the mouse or to move AND click the mouse. One thing you’ll hear from interactive whiteboard sellers is that, though the Wiimote works just as any interactive whiteboard would, it doesn’t have the software to really take your classroom to the next level. Most interactive whiteboard makers, like Smart, restrict their software so it can only be used with their whiteboards. There are tons of Web sites that work really well on any interactive whiteboard (see the resources page), and there is some open-source software out there that can be used with the Wiimote board. But when it comes to building your own lessons, nothing really comes close to the caliber of Smart or Activ software. UPDATE: Promethean just updated its ActivInspire licensing agreement. Luckily, as long as you’re a teacher, you can still use the software with any interactive whiteboard, including a Wiimote whiteboard. On the ActivInspire page, you’ll notice a link to apply for this special teacher’s license. The process isn’t very long — you just have to state that you’re a teacher. For other free and low-cost resources that enhance Wiimote Whiteboard lessons, check out the links provided by first-grade teacher Eric Holshoe on his Web site. One of the most promising aspects of the Wiimote Whiteboard is that each Wiimote can track up to four pens, so it could allow for a multi-user environment. The major interactive whiteboard makers are just now releasing boards that would allow two users to work at once. Unfortunately, though, the software isn’t there to support a multi-user environment on the Wiimote Whiteboard yet. There are several products in the works that would allow multiple mice, but I haven’t been able to find any that would be worth using in the classroom just yet. TeamPlayer, from Wunderworks, comes closest. It allows several mice to move around on the screen at once, but only one mouse can click at a time, which seriously impairs the multi-user functionality you’d want on an interactive whiteboard. The TeamPlayer Sandbox has some interesting games, but most software doesn’t support the TeamPlayer mice as well. If you’re interested, you can download a FREE 30-day trial of the software or buy it for $20. ActivInspire comes with a dual-mouse option, but users unfortunately need to be working on a Promethean board to use it. There’s also software available to turn the Wiimote itself into a mouse. In other words, you can set up several infrared lights on your whiteboard, then, sitting in the back of the room, point your Wiimote at the whiteboard and use it as a wireless mouse. I haven’t tried it yet, but I could see a wonderful application for this with disabled students. Once your Wiimote Whiteboard is up and running, you might have further questions. The Wiimote Project, launched by Johnny Chung Lee, is a collaborative site designed for Wiimote Whiteboard users to support one another. The forums provided me with most of the answers I needed as I began using my board. A lot of teachers stop before they take interactive whiteboards to their full potential. Far too often, they’re used as fancy whiteboards or PowerPoint displays. To really get the most out of an interactive whiteboard, they need to be interactive. That means give the pen to the students. The Internet is full of lesson ideas for this use — you can find thousands of possibilities on Promethean’s Web site, as well as the resources page of this blog. But they can be overwhelming. So here are just a few lesson ideas to get you started with your new Wiimote Whiteboard. Objective: The student will be able to identify digits as ones, tens, hundreds, or thousands. Most teachers find that base ten blocks are a perfect start for studying place value. But it’s difficult to use them for whole-class lessons since not everyone in your class can see the set you hold at the front of the class. That’s why the digital base ten blocks found at the National Library of Virtual Manipulatives are perfect add-ons for any place value lesson. Objective: The student will be able to create a simple circuit with a switch. In my heart, I’ll always be a fourth-grade teacher (4th grade ROCKS! ), and one of the main science objectives at that grade level is basic electricity. Students learn how circuits work and, at least in my classroom, they built simple circuits, with switches, to turn on a lightbulb. That’s why the idea of having students build their own infrared pens to use on the Wiimote Whiteboard is so intriguing to me. To buy the parts in bulk for a classroom wouldn’t cost too much (plus, you could always have students work in groups of four), and students could use the pens they built for the remainder of the year in class. When I was in school, I wasn’t a fan of math — too much boring memorization and drill and kill for me. Those arbitrary rules never seemed to make sense. So when I started teaching math, I took a completely different approach. I felt it was important for students to understand the why behind all those rules. Process over product became my mantra, and the TERC Investigations curriculum gave me some great tools to work with. So I was really excited to find the Illuminations Web site, created by the National Council of Teachers of Mathematics. It offers lessons and applets ideal for teaching the why, and many of their applets are perfect for use on a Wiimote Whiteboard. To introduce the ideas of identity, inverse, commutative, and associative, Illuminations offers a lesson that uses shapes to explain the principles. Check out the lesson, and be sure to find the applet link, which would be a perfect fit on a Wiimote Whiteboard. Objective: (any objective with dates, including) The student will be able to explain how the institutions and practives of government during the Revolution were revised between 1787 and 1815 to create the foundation of the American political system. Dates in history were always difficult for me. Luckily, these days, specific dates aren’t as important as they once were, but it’s still extremely important for students to understand the sequence of events in our history. And one of the best ways to teach students about sequences of events is with timelines. Classtools.net provides a wide variety of widgets that work really well on the Wiimote Whiteboard, including a timeline widget. The program allows users to fill in the dates and add text boxes that include important events. Users can then sequence and resequence the events. Teachers could throw this tool on their whiteboard, and have students work together to complete an accurate timeline for any important historical period. You could set a timer that gives each student 2 minutes with the pen/keyboard. The other students can help, but every two minutes, the pen is passed off. The challenge is that by the time every student in the class has had a turn, the timeline is complete and accurate. Best of all, when the class is done, you can save the timeline to your computer or embed it into a blog or Web page for grading or future reference. I’ve been successfully using the Wii IWB in my high school science class for the past two years. It’s a great, affordable technology. As someone with experience, I would not recommend that you build your own pen unless you really enjoy tinkering with electronics. Several companies are now selling high quality, affordable, IR pens. Actually, some of them are less expensive than the total price of all of the parts and tools you’ll need to build your own! I’ve tested and written an extensive review of several models which can be accessed here: http://electriceducator.blogspot.com/2010/02/ir-pen-product-review-updated.html. Nice Article. I have a question. When you write on the wall with the help of this pen, does it replicate the same on the computer/laptop screen whatever you write on the wall? Yes — the projection just shows what is on the computer. The pen is acting as a mouse, interacting with the computer. The pen, which acts as a mouse, whatever it writes on the wall, also writes on the computer screen simultaneously, right? Now, I was just wondering how to erase the content on the wall, which is written by the IR pen??!!?? Next story Augmented Reality: Does the coolest thing EVER have a place in the classroom?